Boehringer have introduced new changes to Cushing’s testing. All horses on Prascend are eligible for ONE free test per year. To do this you need to visit the Talk About Laminitis website and sign up to obtain your code. You need to give your code to the Vet at the visit to ensure this is free. Fees still apply for any visits and blood samples. My horse has been diagnosed with Equine Cushing’s Disease – what does this mean? This means that your horse has a hormone imbalance which you will need to manage for the rest of their life. This may initially be daunting, but in the majority of cases this condition is simple to manage. How is Equine Cushing’s Disease treated? 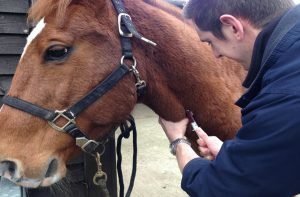 Prascend is the only treatment in the UK licensed to treat the clinical signs associated with Equine Cushing’s disease. Prascend works by mimicking the action of dopamine and therefore regulating the production of hormones from the pituitary gland. When will I see a response to treatment? Clinical improvement is usually expected within 6-12 weeks of starting Prascend treatment, however this can vary. An improvement in demeanour can occur in just a few days. Resolution of signs such as abnormal hair coat or loss of topline muscle, however, can take much longer. 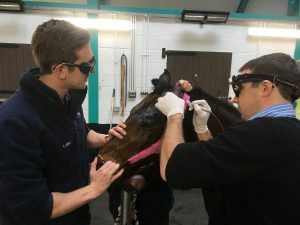 Changes to the severity and frequency of laminitis episodes can be challenging to assess in the first few weeks of treatment as other factors such as diet, weight control and corrective farriery also need to be factored in. For this reason it is recommended that the response to treatment is assessed by repeating the ACTH test 4-6 weeks after initiation of Prascend treatment. Monitoring testing is then recommended every 6-12 months. Last month we had our second successful laser sarcoid removal clinic. Sarcoids are common skin tumours of horses that come in various types and sizes. It is important to monitor sarcoids for any changes in shape or growth, particularly in certain areas. March saw our first gastroscope clinic and this was a great success. All horses came as day patients. Gastric ulcers can seriously impair performance and can affect their overall health and well-being. If you would like to know more about either of the above procedures, please contact the practice to speak to one of our vets on 01535 602988.